The BhaktinHouse is a new sacred space at Zen Awakening Festival.”Bhakti” is the science of love and devotion. 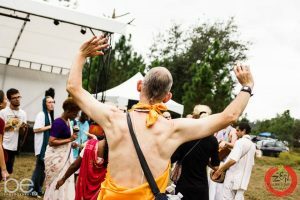 The Bhakti House will be a section / campsite of Zen Awakening Festival bringing Vedic spiritual knowledge into your consciousness. This camp will have Kirtan, (call and response chanting of scared Indian mantras), Yoga, Meditation, Workshops, Chanting, Blessed Food, Performances, Lectures by realmSwami’s, Art, Ecstatic Dancing and more…. Live Performances by Headlining Acts TBA…… stay tuned! !